A multidisciplinary German expert group met in 2012 to discuss the current status and prospects of health care of geriatric patients with urinary incontinence in Germany. The purpose of this position paper is to raise awareness among health care providers for the challenges associated with adequate management of urinary incontinence in frail elderly. The experts agree that a multidisciplinary collaboration is essential for the successful treatment of urinary incontinence symptoms which are often associated with loss of autonomy and social isolation. For most geriatric patients, usually the general practitioner is the first contact when seeking help. Hence, the general practitioner plays a crucial role in the coordination of diagnosis and treatment. The involved health care providers should have adequate education and training in their respective disciplines and should be networked allowing quick turnaround times. Non-pharmacological treatments (e.g. behavioural interventions) should have been tried before any pharmacotherapy is initiated. If pharmacological treatment of urinary incontinence involves the use of anticholinergic agents, cognitive performance should be monitored regularly. If indicated, anticholinergic agents with a documented efficacy and safety profile, explicitly assessed in the elderly population, should be preferred. Eine multidisziplinäre deutsche Expertengruppe traf sich im Jahre 2012, um den Status und die Perspektiven der deutschen Gesundheitsversorgung geriatrischer Patienten mit Harninkontinenz zu diskutieren. Das Ziel dieses Thesenpapiers ist es, die in die Versorgung involvierten Berufsgruppen für die Herausforderungen zu sensibilisieren, die ein adäquates Management der Harninkontinenz bei hochbetagten multimorbiden Menschen mit sich bringt. Die Experten sind sich darin einig, dass eine interdisziplinäre Zusammenarbeit essenziell ist für eine erfolgreiche Behandlung von Harninkontinenzsymptomen, die oft mit Verlust der Selbstständigkeit und sozialer Isolation einhergehen. Für die meisten hilfesuchenden geriatrischen Patienten ist für gewöhnlich der Hausarzt die erste Anlaufstelle im Gesundheitswesen. Dem Hausartz kommt so eine Schlüsselrolle zu; er koordiniert und überwacht die verschiedenen diagnostischen und therapeutischen Maßnahmen. Die in die Versorgung involvierten unterschiedlichen Akteure sollten über eine angemessene Ausbildung in ihren jeweiligen Fachdisziplinen verfügen. Darüber hinaus sollten sie gut vernetzt sein, um nicht unnötig Zeit zu verlieren. Nichtpharmakologische Behandlungsoptionen (z. B. Verhaltenstraining) sollten bei Harninkontinenz zuerst angewendet werden, bevor eine Arzneimitteltherapie initiiert wird. Falls die Pharmakotherapie anticholinerg wirksame Medikamente mit einbezieht, sollte die kognitive Leistungsfähigkeit in regelmäßigen Intervallen überwacht werden. Ist die Verordnung von Anticholinergika indiziert, sollten Substanzen bevorzugt werden, deren Wirksamkeit und Sicherheit gezielt bei Älteren untersucht und dokumentiert wurden. 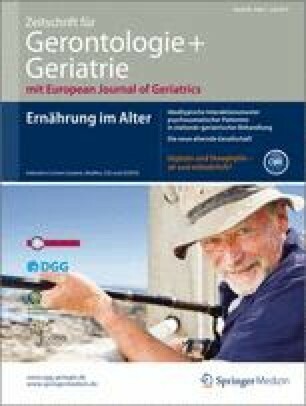 Pfizer Pharma GmbH, Berlin, Germany, organised (Daniela Böhm, Brigitte Ulrich) and funded the “Geriatriekonferenz”, and provided editorial support in the preparation of this position paper (by Edgar A. Mueller) but had no influence on the contents. All the authors were responsible for critical revisions of the manuscript and for important intellectual content. On behalf of all authors, the corresponding author states the following: MW was employed by AstraZeneca R&D, Mölndal, as director of discovery medicine (= translational medicine) from 2004–2006, while on sabbatical leave from his professorship at the University of Heidelberg. After return to this position in January 2007, he received lecturing and consulting fees from Sanofi-Aventis, Novartis, Takeda, Roche, Pfizer, Bristol-Myers, Daichii-Sankyo, Lilly, LEO, Shire and Novo-Nordisk. KB received lecturing and consulting fees from Astellas, Mundipharma, Pfizer and Grünenthal as well as travel fees from MSD, Merck and Takeda. KCS received lecturing fees in the field of overactive bladder from Bayer and Pfizer. MO has been working as consultant, lecturer, or trial participant in the area of LUTS/BPH, OAB, or urinary incontinence for the following companies: Allergan, Apogepha Arzneimittel, Astellas, Eli-Lilly, Ferring, GlaxoSmithKline, GT-Urological, Pfizer, Recordati, Sophiris and Teva. UP is employed by Coloplast GmbH.